Jyabura is the leader of team made by himself, Fukurou and Kumadori. He ate the Devil Fruit Inu Inu no Mi Model: Wolf (Dog Dog Fruit, Model: Wolf), which gives him the power to change into a full wolf and a human-wolf hybrid that resembles a werewolf. 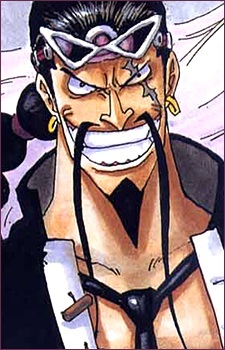 He believes he has a strong rivalry with Rob Lucci, who seems mostly disinterested in any such notion. Jyabura is extremely competitive, and gets outraged when someone surpasses him (for instance, he didn't like when learned that Kaku became stronger than him). He is also very superstitious, believing that if someone who has eaten a Devil Fruit gets too close to another Devil Fruit, their body will explode as the two devils confront each other, though Blueno explains that this is not the case. While fighting, he tends to deceive his opponents to get them off guard. Initially Jyabura chooses to fight with Sogeking, but after Sogeking showed to have no match, Sanji abruptly appears and saves his friend from being killed by Jyabura. It then starts a fight between Sanji and Jyabura, where Jyabura is defeated by Sanji's Diable Jambe, which breaks through Jyabura'sTekkai. Jyabura is the only one of his unit to master Tekkai Kempo, a technique that allows him to use martial arts while using Tekkai.